Scarborough Fair is a timeless folk song from England. This is its most famous melody (yes, there are others, less familiar, but also beautiful). 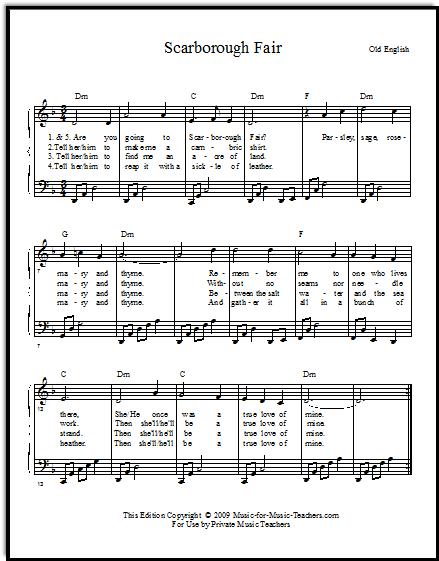 Scroll down the page for the link to the free downloadable score. This Scarborough Fair voice arrangement is in a good range for most singers, the key of Dm. Just a nine-note range makes it approachable for girls and boys. If you were looking for the vocal duet that Simon and Garfunkel sang, I'm sorry I can't offer it here. Though the folk song, Scarborough Fair, is public domain, Simon and Garfunkel's ARRANGEMENT of the music is NOT public domain. I'm pretty sure Simon and Garfunkel wrote the version they sang, which means it is their copyrighted intellectual property. I found great ideas for my guitar unit on your site, as I didn't know where to begin. Thanks to you I will survive my next 6 weeks. I also teach choir to middle school, and I love your little morning warmups. Looking forward to more of that in the future. Keep up the great work, it is very inspirational for us beginner teachers.